Sugarbush Valley: An ideal life: A change is as good as a holiday! The Chocolate family was settling in nicely in Sugarbush Valley. 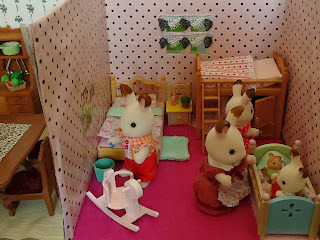 Although her house was small Teri Chocolate was very happy to be back in her birth country. They were planning to start with some renovations soon, but the materials haven't been delivered yet. She just wished they could get hold of the owner of the building so that they could lease the ground floor as a shop for their Pizza Parlour too. Mayor Hugo was doing everything he could, but the owner has disappeared. So for now the shop stays boarded up. Just as Teri was about to ascend the stairs to their apartment she noticed Pete Petite with a large roll of paper. Pete: Teri, so glad to see you. I have this rather large and unusual package for you. It came today. Teri: It must be the wallpaper for our apartment. This is excellent news. Thank you Pete. Teri: Thanks for offering, but Frasier is in the apartment, let me call him. Teri went to the front door and called out to Frasier, who responded immediately, and was just as excited as Teri when he saw the package. Frasier: Hi Pete, thank you so much for the trouble you took to come and deliver this. We've been waiting quite a while for the wallpaper. Pete: Only doing my job, and it is a real pleasure. Teri: Any news from Margaret? Pete (blushing scarlet red): Uhm... no, but she will be visiting soon. Teri: Oh that is fantastic news! I really want to meet her, hope you will have a chance to introduce me. Pete (smiling): I want to introduce her to the whole village. Pete: Well I'm off, see you soon, and good luck with the renovations. Frasier and Teri took the packages and went upstairs. Both couldn't contain their excitement, and were planning and chatting about the renovations all the way up. That evening Frasier and Teri planned the renovations at length, and they decided to begin the following day. They had nothing else to do, and have been living in this dreary apartment for long enough. They both felt it was time for a change, and everyone knows "un cambiamento è buono come una vacanza". The next day Frasier contacted Sydney Hazelnut to confirm if there was a room available for them in the commune. They were lucky to get a room, and though it was small it was perfect for the time being. Frasier and Teri spent the whole of the next day packing up their house and getting it ready for wallpapering. A few weeks passed and it was finally time for Frasier to surprise Teri with their new apartment. Frasier had a few surprises up his sleeve for his darling wife. She wasn't allowed into the apartment while the renovations were being done. Frasier: So darling, here we are. Welcome to our new home! Teri: Wow Frasier, what have you done! Frasier: What do you mean with what have I done? Don't you like it? Teri: No no no, I mean it looks fantastic, and so different. Look at my fantastic kitchen! And I love the dresser. It is perfect. Frasier: Aaron Cottontail made both pieces and Eric Renard helped me to build in the stove and sink. How does the wallpaper look. Teri: It is so clever, everything we need into such a small space, it is fantastic.I'll have to thank them both personally. The wallpaper looks wonderful too. It blends in really good with everything. Oh Frasier, I'm so happy. Frasier: I'm glad honey, all for you. Did you notice the sleeper couch? You alright with still sleeping on that? Teri: I did, and yes I'm fine with it. I'm so used to it now that it is actually comfortable. Frasier: I'm really relieved to hear that, the only part I was worried about. Ready to go upstairs? Teri: Oh yes upstairs, of course! Frasier: So this is the girls room and the small en-suite shower room. As you can see not much changes. Freya just got a new bed. Do you think it is too pink? Teri: I don't know what to say, it looks just as good as downstairs. And too pink, are you kidding? It can never be too pink. They will love it. Teri: I love the shower room. The tiles looks fantastic, and you even managed to make the pink toilet look amazing. Thank you Frasier! Frasier: I'm so glad you like it, it is quite difficult to think like a woman when it comes to decorating. I must confess though I had help from a few village women. Teri: Well now I owe some more people a thank you, and I'm sure you were the mastermind behind it all. As they were talking they heard the front door opening, and heard a squeal. They rushed downstairs, only to find Freya and Cremé. They were as surprised and astonished by the transformation of their little home. 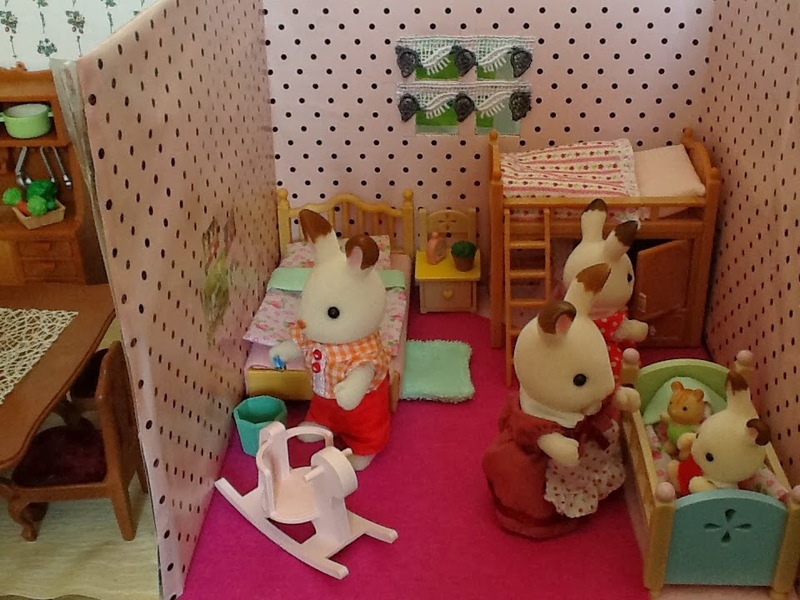 Frasier beckoned Freya and Cremé upstairs to show them their new room. As expected they loved it. Freya: Oh daddy, how amazing, I can't believe it is the same room. So pink and girly. I love it. And my new bed is divine. Thank you, thank you. That evening Teri prepared one of their favorite Italian pasta dishes on her new stove, while Freya set the table. The Chocolates surely felt like they just returned from a holiday! Oh I love love love this story and your beautiful pictures! Made my day to look at them cute critters! Your chocolate rabbit family is so adorable. I admire the way you make everything fit in such small houses! Thank you, thank you! It is quite ironic that they got a house so soon, as they are not a favorite family, and there are so many others that need a house! But I loved decorating their house and feel so satisfied! And your comments make it even the more satisfying! Thank you Jennifer. Please reveal as much as you can, and yes get a move on with that decorating. Are you on the forum?